Playing off of the album’s title, each day for the 21 days before the the album drops, new exclusive content will get released. 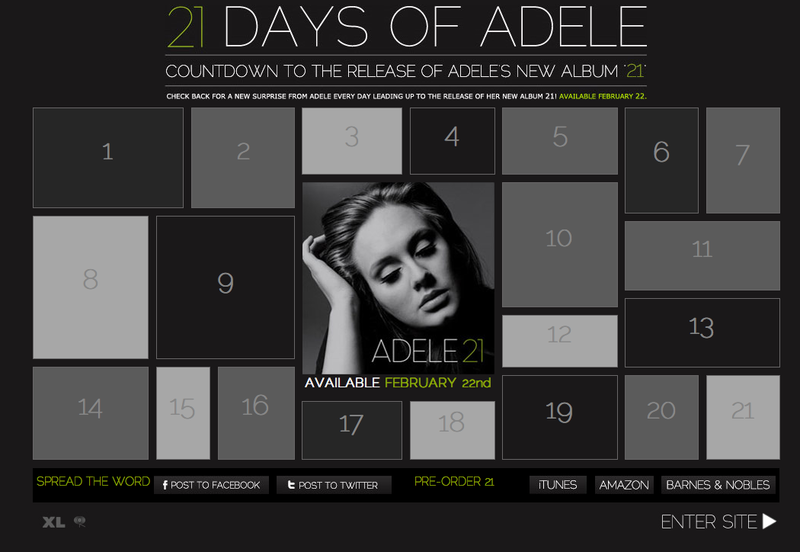 Much like the advent calendars children receive for the 25 days of Christmas, the “21 Days of Adele” splash page boasts a grid of dates that are unlocked each day revealing the content of the day. So far on days 1-7 we’ve seen exclusive interviews and performances. Day 5 brought the first campaign within a campaign. On this day, team Adele announced a contest to be run through Facebook, in which fans submit their favorite Adele lyrics to enter to win a signed lyrics booklet. In order to enter and receive “priority” when they pick the winners, fans are told they must first Like Adele’s page and then ‘suggest their friends’ to Like the page as well. This is a simple yet likely effective campaign to increase her Facebook numbers. 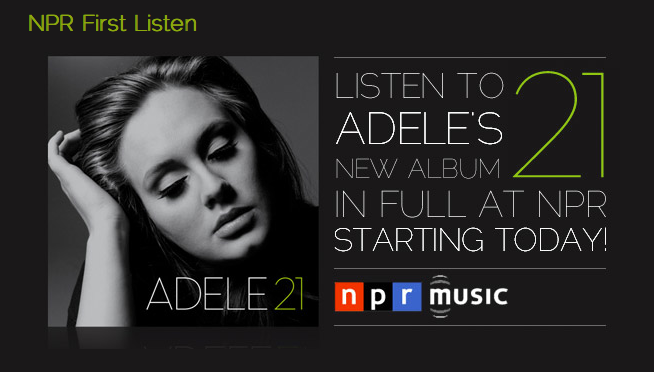 Today, the 7th day of the campaign, fans were directed to an exclusive NPR First Listen of 21 in its entirety. It’s a widely known concept within the industry that giving away music will transcend into more music earnings in the future. Some may argue that by providing her fans with the opportunity to listen to the new record over and over for free, Adele is risking decreasing the value of the record and eventual record sales. But getting fans to hear these songs and starting that dialogue and generating connection to the music will do nothing help her and this album; it’s a smart move on Team Adele’s part. True, 21 will probably find success because of Adele’s strong following and the fact she is damn well one of the most talented vocalists in the industry, as well as her being a very strong songwriter. But this is the type of campaign that can help take its release to a different level. I’m interested to follow the 21 Days of Adele as they unravel and see what other tools these guys utilize to promote this album and gain new fans along the way. Very creative, very fun for fans. I tip my hat off to Adele.